Why should you include dips in your training? 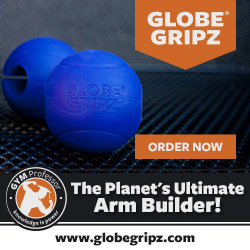 Because they are one of the greatest upper body muscle and strength building exercises ever created. Aside from chin-ups, dips are a best test of one’s upper body strength to body weight ratio indicators and a very functional exercise. Working out and lifting weights has been a huge part of my life forever so I’ve had my fare share of aches and pains. I developed a shoulder problem about 15 years ago, back in the “How much do ya bench?” days. The shoulder joint is the most mobile joint in the body and therefore, inherently prone to injury. I attribute most of the damage to my practice of including heavy Behind the Head Military Presses but deep weighted dips and, of course, my beloved Barbell Bench didn’t help my shoulders either. At one point the pain was so bad I had to shampoo my head with just my left hand. I went the normal route of treatments that included anti inflammatories, ice packs, physical therapy and cortisone shots but it finally came down to surgery for Shoulder impingement syndrome. After more of the previous treatments I was back to heavy benching but I was smart enough to drop the Behind the Head Militaries. My shoulder was good enough to carry me through about ten bench press contests in the following three years. My name is Jim Vaglica. I’m a full time Police Patrol Sergeant in Waltham, Massachusetts and I’m on call 24/7 with a regional SWAT team. I was captain of Team Cops on Mark Burnett’s Expedition Impossible, which aired on ABC during the summer of 2011. How did you get cast to be on Expedition Impossible on ABC? The Vegas Bash is an annual event with over 100 Reality TV Celebrity’s from Survivor, Big Brother, The Amazing Race, MTV’s Challenges, Road Rules and Real World and more in attendance. AfterBuzz TV was live at the event interviewing all the reality stars. In this interview AfterBuzz TV host Ryan Allen Carrillo interviews Expedition Impossible’s Jim Vaglica. Jim gets tased in this video taken during a SWAT training day. Watch him take the hit and ride out 5 seconds of intense pain. The instructor then describes the process of removing the barbs. Examples would be any photos involving law enforcement, Military, Fighting Arts, Weapons, Toughness or anything you believe portrays you as a survivor.